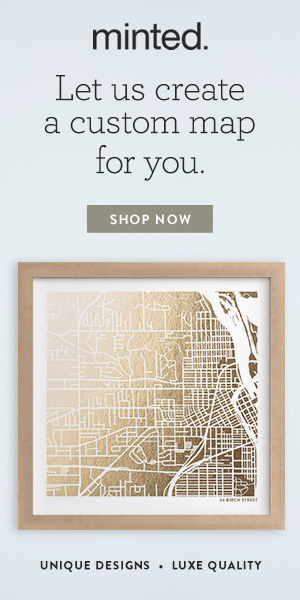 One of my absolute favorite inspiration launchpads for decorating a room is a beautiful work of art. 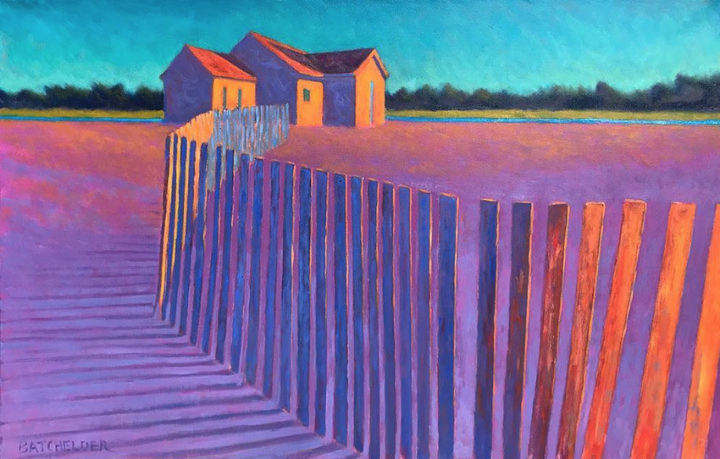 And as a Granite State resident, color lover, devotee of old buildings, and art-collector-wannabe, I have long been an aficionado of New Hampshire and Massachusetts artist, Peter Batchelder. All images used with permission of the artist. You would be, too, if you could get up close and personal with one of his glowing abstract expressionist New England landscapes! Living room, inspired by a painting by Peter, by Meredith Rodday, as seen in the Boston Globe. Or that moment of hush as the sun rises before the world gets busy and about its business. But what has also impressed me about his work — in addition to his talent and unique vision, of course! — is how he actually seems to be making a living at it, especially without going commercial. What follows is a story of a man who is living his dream, and is doing so thanks to, yes, huge talent, but also hard work, perseverance, pragmatism, and perhaps the self-knowledge born of decades of determinedly plugging away at something he loves. Peter grew up in Natick, MA and Cape Cod and received his fine arts training under artists Jack Coughlin, Lionel Gongora, John Grillo, and Hanlon Davies at the University of Massachusetts, Amherst (BFA 1984). However, like so many a bright young man before him, he learned that being an art major in college little prepares one for earning a living following graduation. So he taught himself graphic design and worked for ad agencies, newspapers, colleges, as well as in a freelance capacity, for 20+ years. He even founded his own website design and software company. All the while, he kept plugging away at his art. Shall we meet the guy? HGD: I’m such a sucker for luminous light and depth of color in art. Your work is so identifiable and glows from within! How did you find your particular style and subject matter? PB: My biggest art inspiration was originally Andrew Wyeth, a brilliant artist who worked in about 4 colors — moss green, ochre, sienna, and dark grey. I was really into realism back then, and I loved his technique and how he made things look like they really were. But over time, I found pursuing this realism in my own work boring. And about 20 years ago, I got so bored with the tediousness of it that I decided to go fauvist and come up with my own color ideas. Not try to match the realities of the colors that I saw. I started studying Wolf Kahn, Fairfield Porter, Willem De Kooning, and other abstract expressionists. My style really changed, almost overnight, and I started editing out as much as I could of the details and make color more of the subject matter than the thing I was painting. It felt really good, so I stuck with it. HGD: Why do you think so many people respond to your art? PB: I think that they like that the subject matter feels familiar and yet doesn’t feel like a landscape of a particular place. 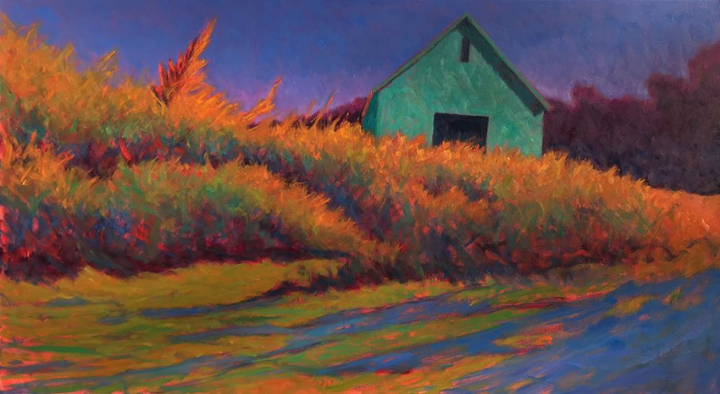 I have clients who say they would never buy a “barn” painting, but mine doesn’t feel like a barn painting, they say — it feels to them simply as art, meaning color, some abstraction, and mood. I try not to make any of my pieces literal; I bring what I’ve witnessed into the realm of abstraction. When I’m working on a composition, I start with a charcoal sketch and strip away the extraneous details. I then move to pastels to get an idea of color. By the time I’m in oil paint, I’m only working from my sketches, not from a photograph or on site. So while the places and inspiration are real, the final product is 90% imagination. HGD: I wouldn’t be surprised if they also respond to the way you can capture and communicate that vibrancy people can feel inside when they witness those “changing times of day” but perhaps have a hard time of expressing. PB: Thank you! I’ve been told by collectors that they love the aspect of light that makes the piece a bit of a mystery, in that the light can be interpreted as early morning or dusk. HGD: One of the things that strikes me about your biography is that, while you have had a very pragmatic approach to life as a working artist, that pragmatism never gets in the way of remaining true to your artistic self. How do you combine those two qualities? PB: I have a background in the working world. And while I’m an artist and art is the heart of what I do, I don’t think there’s anything unartistic in treating your studio like a business. My wife and I owned a gallery on Martha’s Vineyard for 3 years and loved it. It was a great learning experience – I learned firsthand about working artists. Some were very responsive to our efforts to sell work. Others were a bit less responsive, and at times, seemed too attached to their work…almost disappointed to hear a piece had sold! I learned a lot about the art business from that side of the equation. In my opinion, there should be zero obstacles for a gallery making a sale on an artist’s behalf. Galleries are businesses, and they appreciate an artist’s concern for inventory, responsiveness to client requests, self-marketing, and not allowing their work to be poached by competitors. HGD: And good business sense means you can keeping creating more art! PB: Right! It actually helps. While it’s tedious to maintain sales records, inventory, and to keep up with marketing, it all contributes to your goal of making art. It cuts into your studio time, but I find it makes my work and process more efficient. HGD: Tell me more about your particular business model. You don’t sell through some of the large “curated online art galleries.” How do you reach your buyers? PB: All the while I was in the corporate world, I knew painting was what I wanted to do and make more of a mainstay at some point. The kids got older, and as time started leveling off, I could put more and more time and energy into my studio work. I started getting little pieces in little galleries. Then I started working exclusively in oil and increasing the size of my canvases. Slowly, that built into a business. Once you get representation at a good gallery, you come to the attention of other galleries at the same level. I very strategically expanded my representation so that geographic coverage didn’t overlap. Galleries work really hard on my behalf, so I don’t want to cannibalize that relationship by pitting galleries against each other, particularly those in close proximity to each other. HGD: Your main subject matter is the Cape, New Hampshire, and Vermont. Do you ever branch out to local subject matter for your galleries in other parts of the country – South Carolina and Napa, for example? PB: Not really. The paintings I like to do and the ones that come out well are the ones that are inspired by the subject matter I know the best. I try to be true to what works for me. If what I’ve painted works for other regions, great. But if it doesn’t, that hasn’t been a big obstacle. Again, most people seem to respond to my work as a work of art…a contemporary painting, and not because it is about a particular place that is familiar to them. HGD: However, you do accept commissions. How does that artistic integrity translate to painting on request? PB: My process is pretty straightforward, but it may not be the typical commission route that you, as a designer, may be familiar with. For me, a commission usually comes about because a client, whether homeowner or designer, has seen a work of mine at a gallery or on my website that they loved, but it is no longer available, or the size isn’t right. HGD: You do like BIG canvases! PB: (Laughs.) Yes, I do! I love large canvases, as my painting style lends itself to big space. I think this is, in part, due to the years I spent working in much smaller format, very tightly, striving for details and reality, whereas now I like the piece to begin much more expressively and to retain as much of the energy that goes into it. With commissioned works, I want there to be zero pressure on the buyer, so I don’t take deposits. My approach is, take some general input from the designer…color, subject, general composition, and work up sketches and color studies that meet those criteria. For designers, that could include the use of a color that is to be used somewhere in an interior plan. The goal is to complete a “commission” so that it is a painting that I would have done anyway, but contains some of the elements the buyer hoped for. And again, if they don’t love it, I don’t want them to buy it. I can put it in a gallery and trust that someone else will be touched by it. HGD: That takes a great deal self-knowledge to potentially walk away from a sale! Do you ever sell directly to clients, rather than through your gallery representation? PB: Rarely. I channel inquiries that come directly to me through the galleries. In the past I have offered a few pieces for sale through the studio…almost exclusively, though, these have been works that have been through the gallery circuit and find their way back to me. But even then, if the party inquiring indicates they have seen my work at one gallery or another, I bring that gallery into the transaction. HGD: I completely understand. However, I do love that you now offer fine art prints in various sizes and many of your pastel studies directly from your website. PB: Many people just can’t afford to invest in a 60” x 40” original oil painting of mine, but may still be interested in a piece. If collectors of any means are inspired by my work, I want to find a way to make it happen if I can. And for designers, having access to limited edition prints has enabled them to fill an art need for a design project with more works, where budget would not allow for as many original paintings. HGD: Any final thoughts you’d like to impart? PB: I’d love it if more people thought of art as the starting point for their interiors (HGD: I agree!) rather than as the finishing touch. Your home is a very personal place…and you spend a LOT of time there. Having pieces around you that mean something to you makes your space that much more personal. A buyer recently told me that she is buying art not only to bring beauty to her home, but to have something of significance to pass on to her children. Not many things are being handed down any more – china, rugs, furniture. But you can hand down art. Good art is timeless! Peter’s website is fantastic, offering a full catalog of works for sale (as well as all the galleries that represent him and the works featured there), pictures of installed work, and pastels and fine art prints available. You also should definitely follow his Instagram feed, where he gives insight behind the inspiration! And if you pick up your own Peter Batchelder painting as an inspiration launchpad for your home, you should definitely give me a call! What Comes First, the Interior Design or the Art? It’s the beginning of February school break here in New Hampshire, the weekend where we overlap with Massachusetts. After the inhabitants of that southern New England state head back below the border and we Granite Staters get our ski hills back to ourselves, I’ll be spending some quality outdoor time with my men. Stay warm, and see you in a couple of Saturdays! Wow, what an education and connection to have! I'm a wife, mom to two super busy boys, old-house devotee, and decorator living in the great state of New Hampshire! My passion is helping homeowners decorate their own "Forever Homes" with fresh classic style that will stand the test of time. Welcome to Home Glow Design! Subscribe to Home Glow’s Saturday blog!